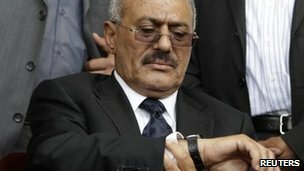 A deal for Yemen’s veteran leader to hand over power and end unrest looks in doubt after President Ali Abdullah Saleh wavered over signing it. He had been expected to add his signature on Saturday after his officials said the deal brokered by Gulf Arab states had been accepted. But Gulf mediator Abdul-Latif al-Zayyani was reportedly told Mr Saleh still had reservations. 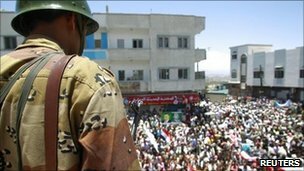 New clashes in the Yemeni port of Aden have left three people dead. Officials said two of the dead were members of the security forces, shot while trying to dismantle road-blocks set up by protesters in the al-Mansoura district. The third person killed was a civilian. Mr Zayyani, the secretary general of the Gulf Cooperation Council (GCC), flew into the Yemeni capital Sanaa to urge President Saleh to sign the deal, which was accepted by Yemen’s ruling party a week ago. Under its terms, the president would hand power to his vice-president in return for immunity from prosecution. But a close ally of Mr Saleh, Abed al-Jundi, said the president objected to signing the agreement, saying it should be signed instead by the leader of his political party, the Ruling Party Congress. He added that Mr Saleh also wanted to ensure that he would remain president to oversee a 30-day transition period after signing the deal, the Associated Press news agency reports. A leading opposition member, Mohammed Basnadwa, said they had subsequently told the the GCC mediator that they would not back any deal unless Mr Saleh signed it first. The opposition coalition approved the deal earlier only after its leaders had received “assurances” from the GCC, the US and Europe on the transfer of power. However, the deal drove a wedge between the opposition coalition and youths who have led demonstrations against the president across the country for months. They accuse the politicians of breaking a promise to put Mr Saleh on trial.